Hiroshi Abe speaks earnestly in The Bluebird. The Skinny: A stuttering, earnest substitute teacher makes waves in a class trying to get over an attempted suicide of one of its students. Fine themes, compelling emotions and solid acting lift The Bluebird, but the measured, too-reverential storytelling doesn't entirely convince. by Kozo: It possesses a very worthy message, but The Bluebird's execution is so measured and manufactured that it doesn't completely ring true. Kenji Nakanishi makes his directorial debut with this well-meaning drama based on a novel by Kiyoshi Shigematsu. One semester later, the students at Higashigaoka Junior High are coming to grips with the attempted suicide of Noguchi, a male student who has since changed schools. In the aftermath of his suicide attempt, the students in his former class have reflected on the incident through counseling. As a further measure of healing, the school creates submission boxes called "Bluebird Boxes", where students are meant to voice their anonymous concerns and questions. The entire school seems determined to put the dark event behind them. But Mr. Murauchi (Hiroshi Abe) won't let them. Their new substitute teacher, Murauchi arrives at the school with an extended "star" entrance, as director Nakanishi makes sure not to show Hiroshi Abe's face during the film's opening minutes. Finally, after what seems like an eternity, Murauchi raises his head, allowing his face to be glimpsed, and he finally speaks - and he stutters. His students initially laugh, but Murauchi's issues with communication make him a much more understanding human being. He gravely tells the students that he may not speak eloquently, but he does speak earnestly. And, earnest words should be received earnestly by the listener. However, what Murauchi proceeds to do seems less earnest than it does quietly inflammatory. 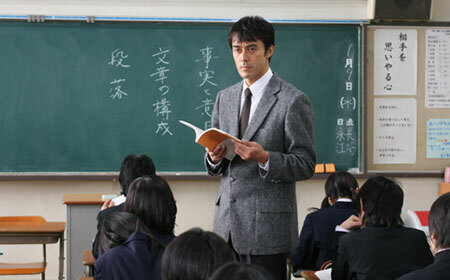 Murauchi's first action as teacher is to retrieve Noguchi's desk and restore it to the classroom. Each day, he greets Noguchi as if he's still in the class - which disturbs the students, and then causes the faculty and the parents to buzz with concern. After doing this for some weeks, one would think that Murauchi would be up for some serious disciplinary action, but the faculty largely lets him be, only holding the occasional meeting to obliquely register their disapproval. Meanwhile, Murauchi receives minor support from fellow teacher Ms. Shimazaki (Ayumi Ito), who launches into spontaneous speeches offering both encouragement and exposition. Murauchi's goal is for the kids to take responsibility for their actions and to not forget about Noguchi, even if he has to make them feel like complete crap every day for what they've done. But what have they done? There's a backstory here, and its slow reveal largely drives The Bluebird's narrative. The whole class carries varying levels of guilt or denial over Noguchi's suicide attempt. Chief among the kids is Sonobe (Kanata Hongo), who regards both Murauchi and the extended drama over Noguchi with an obvious and pained interest. Ultimately, Sonobe must come to terms with what he might have done to Noguchi while at the same time learning to understand his odd and haunted new teacher. In a rare bit of restraint, director Nakanishi only hints at Murauchi's demons and allows the audience to connect the dots on their own. There's never a full-on speech from Murauchi about his personal pains, and Hiroshi Abe is able to convey more than enough through his stilted delivery and sympathetic, deep gazes. Also, the film earns points for questioning the school's method of "healing", and how it may or may not be lip service meant to excuse a person's guilt. Ultimately, The Bluebird preaches individual responsibility - a message that's worthy and even compelling. It's also portrayed realistically, as not all the students become willing converts of Murauchi's maverick schooling. Basically, some people try to own up to their errors while others don't, and when the dust clears only a portion of the kids take the necessary steps to grow up. In many ways, the outcome that The Bluebird portrays is just like life.